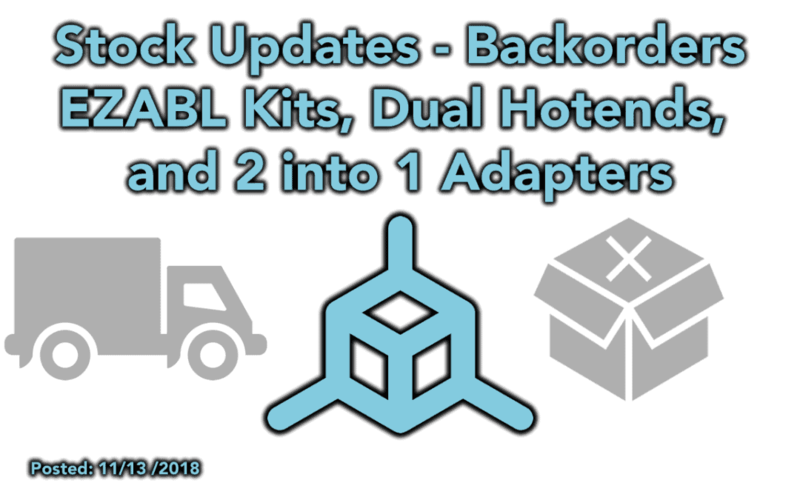 We wanted to let everyone know that we are in a backorder status for the EZABL Kits (full size), Dual Hotends, and the 2 into 1 Adapters. EDIT: Due to high demand we have allowed the EZFlex plates to be backordered. These will also be in our possession in the same time frame stated below and are in transit to us already. This hasn’t happened in a while but due to a surge of orders on these items our stock went down faster than expected. When we saw the surge that started at the beginning of the month we immediately re-ordered the parts and products. What does this mean and when will the product ship? This means that from the time of making this post if you order or ordered one of these items and it shows “Available on Backorder” on the product page your order should be shipping in no more than 7-12 business days from the time we made this post. All of these products and parts to build the EZABL kits are already on their way to our location and we will make sure that they are completed as quickly as possible so we can get you your products. What if I don’t want to wait? If you do not want to wait then please Contact Us with your order number and we can cancel the order then issue a refund. If you do want the product(s) we recommend that you just leave the order as then you will be guaranteed the parts. If you cancel and wait for the restock you may miss out if there are a lot of other waiting to order as well. TLDR; if you want to cancel contact us, if you want the product then back-order it and you will get it when we get them in.